Beth Bowman is a long-time SJBS member and a past-president. Her original designs and skill in bead embroidery have won Beaders' Challenge awards. Bead embroidery is the process of stitching beads to fabric or other foundation material to embellish the surface. 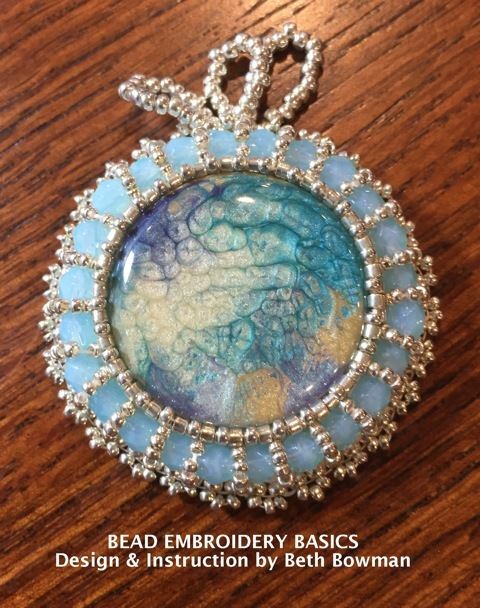 In this class, students will apply fundamental bead embroidery techniques to make a pendant. •Attach beaded loops for hanging the pendant. bead embroidery foundation material, ultrasuede backing material. A Supply List will be emailed upon registration confirmation. This workshop is suitable for participants new to bead embroidery and those with some experience. Fee: $55 members; $85 non-members. Registration deadline is Thursday, Feb. 7th, unless the class size limit is reached before then. Thank you.